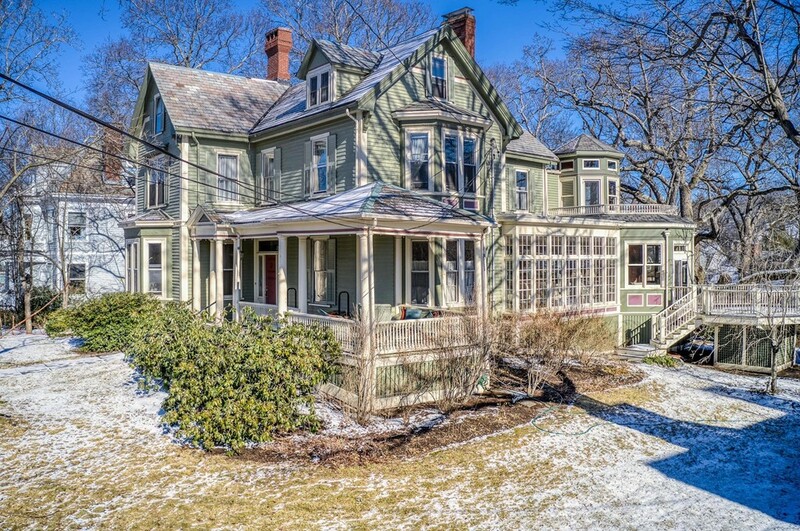 Don't miss this rare spectacular & breathtaking Newton Centre grand Victorian home on desired tree-lined side street just blocks to green line T, restaurants, shops, parks, playgrounds & near some of the best schools in the state! Built in 1880 w/13 rooms, 6 beds, 4 baths & 5 fireplaces, this gem has museum-like qualities! Period detail galore, this home really impresses w/ striking ceiling medallions, inlayed wood floors, 10' soaring ceilings, bay windows, oversized crown molding/window trim, turreted bedroom ceiling, built-ins, marble & wooden mantled fireplaces, luxurious vintage light fixtures, stained glass window, winding wooden staircase, wall of windows & custom wooden trim-work inside & out. Renovated luxury kitchen w/ enormous Sub-Zero fridge, double Wolf ovens, Wolf gas cook top & vent hood, 2 sinks, enormous L-shaped Island (room for 4/5 stools) & granite counters. Large front porch & 4 decks including exquisite gazebo! Open house 2/7,2/9,2/10 from 11-1pm & 2/11 5-7pm! response. ac in rear of 1st/2nd floors only.